The Michigan State University Community Music School is home to the Grammy Award-winning MSU Children’s Choir, the Young Women's Chorus, the Young Men's Chorus, the CMS Singers, and Cantabile. 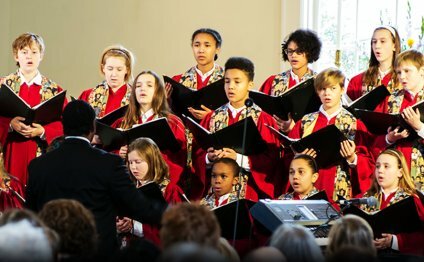 These choirs are made up of students from the community who enjoy singing, learning, and meeting new people. Each choir needs enthusiastic, talented, and creative singers who are ready to work hard, challenge themselves, and have fun. Students must audition for each choir, but no audition material is necessary. Please call (517) 355-7661 to make an appointment. Auditions are 10 minutes long and audition material does not need to be prepared in advance. Below is a list of available audition dates and times. The Children and Youth Choir Program is planning to release a professional quality CD in the spring of 2016. We are so thankful for the many generous donations we have received so far to help bring this project to life, but we still need your help! This project involves all of our singers so support from any choir program is appreciated! Click here to learn more about this project or to donate. The Children and Youth Choirs Program is offering an Elementary School Honor Choir on . This opportunity is open to any student in the greater Lansing area schools currently in grades 3-6. Stay tuned for more information on this program and how to sign up. How we Need the River - Sulamita youth Choir "Song Of Soul"